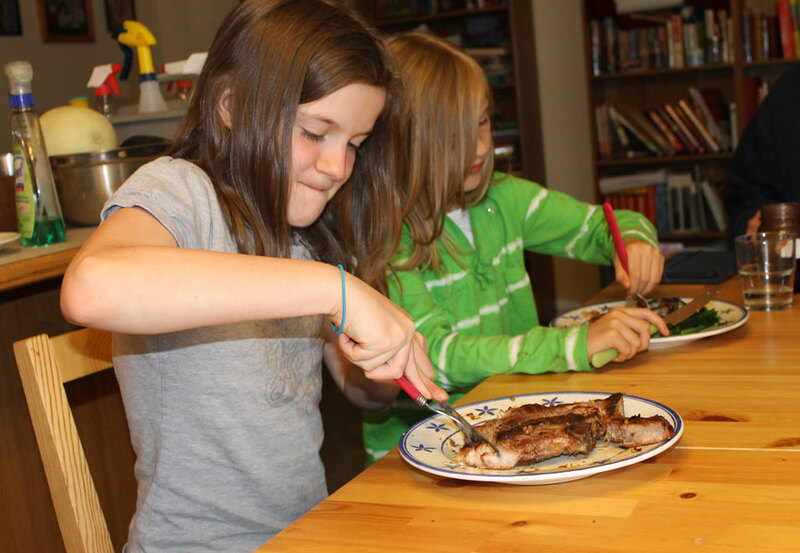 Is Paleo Safe For Kids? 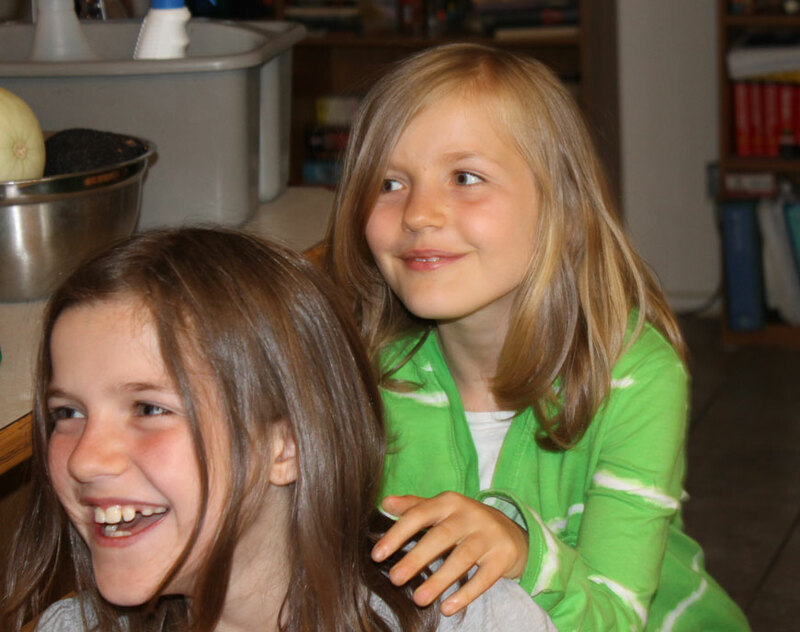 You only have to look at the pictures of my children to see that they are thriving and full of energy! 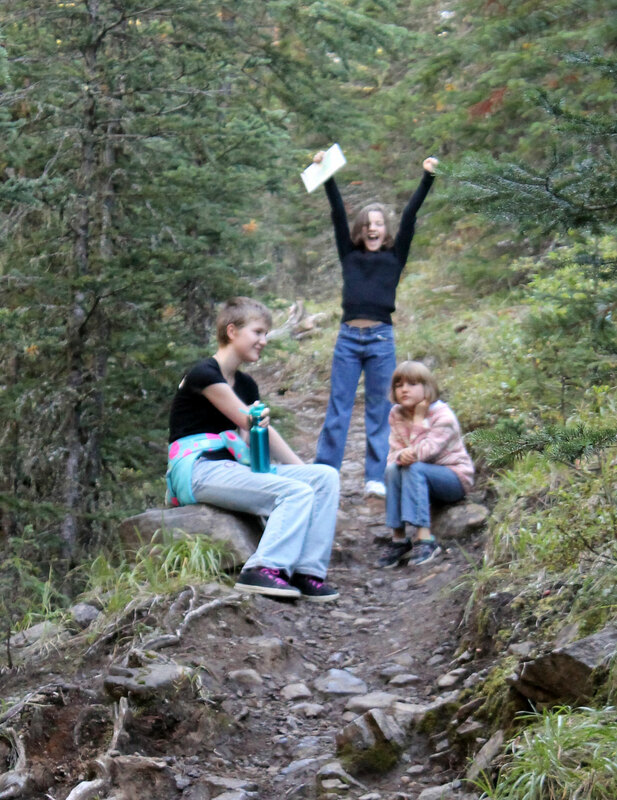 There are a few caveats however… if your children are normal weight, healthy, active kids, they do not want to be on the very low-carb, weight-loss program that you might be following (over-weight and obese kids are a different matter – they need the low-carb diet in order to loose some of the excess weight (1), but they also need plenty of healthy fats to fuel their growing and developing brains). So don’t be afraid to give your kids sweet potatoes and other starchy veg. And don’t be afraid to give them the healthy fats (avocado, olive oil, olives, coconut oil, coconut, oily fish and even animal fats (100% grass-fed or pastured meat only) all count as healthy fats). Let them eat plenty of fruit as well… I always have a fruit-bowl on the kitchen counter that the girls know that they can snack from freely. If they are lethargic, lacking in energy or actually loosing too much weigh, up the carbs in their diet and up the healthy fats as well, and that should solve the problem. When you think about it, 50,000 years ago, stone-age mama and papa did not cook a hunk of meat for themselves and then pull out the wheaty-puffs for the stone-age kidlets… they fed the kids exactly what they ate. And those kids thrived – if they hadn’t, the human race would have died out way back then. And even today, most cultures feed their kids on what they eat – spicy foods, fatty foods, veggies, you name it. If the adults can eat it and thrive, the kids can to. It is only in the West that we feel that we should be feeding our kids special “kid-friendly” food. And usually, this “kid-food” is pretty unhealthy stuff – high in insulin spiking carbs, lots of sugar, lots of salt, lots of food-colourings, artificial flavourings and sweeteners and laced with trans-fats – exactly the opposite of what growing bodies and brains need to eat. So will giving up grains harm your child? No one needs to eat grains. And calorie for calorie, grains, even whole grains, are lower in nutrient density than fruit and vegetables. There are some useful graphs in this post that show the percentage of vitamins and minerals found in grains compared to vegetables, demonstrating that those veggies are the clear winner. And your child can obtain plenty of carbs from fruit and veggies…. and as a side-bonus, they will benefit from the larger amounts of nutrients. A Paleo diet almost consistently contains in excess of 100% of the RDA of all vitamins, with the exception of vitamin D, and the same is true of the vast majority of essential minerals as well. This post demonstrates this fact.. And whole grains are not necessarily the best source of dietary fiber either. Fruits and veggies contain at least as much fiber as whole grains do, so don’t worry that your child will lack for fiber or become constipated if they are not eating whole grains. As long as 50% of their plate is filled up with veggies they will be fine. And when you consider the anti-nutrients in grains and pulses, you have even more reason to feed your children on a paleo diet. Most of our immune system is based on our gut flora and intestinal mucosa. The anti-nutrients in grains and pulses can damage the gut mucosa leading to leaky-gut syndrome, and it can alter the balance of the healthy gut flora (the friendly bacteria that live in our guts and help with immune function). For a child with an immature immune system, this can be bad news as it can lead to impaired immune development and even food sensitivities, intolerance and allergies later in life. (take my example – I developed a serious allergy to dairy in my mid 30’s and non-celiac gluten intolerance in my late 30’s early 40’s). Gluten and lectins in grains and legumes damage the intestinal mucosa. This can prevent full absorption of the vitamins and minerals in your childs diet meaning that you child is not getting the full benefit of the food they are consuming. Despite what people may tell you, giving up grains will not mean that your kids will be lacking in carbs… not only can children manage perfectly well on a ketogenic diet, they can thrive on it. They actually use this kind of diet to help control drug resistant epilepsy and other neurological disorders in kids. And those kids on a ketogenic diet remain perfectly healthy, with no weight gain or heart disease. Besides, if you allow them free access to fruit, they will get more than enough carbs (fruit is very high in fructose). And you can always supplement with the more starchy veggies if you feel the need. I have yet to meet a kid who does not love sweet potatoes! J likes the look of her dinner! And my experience is that the older the kid, the easier it is… teens may be resistant at first, but they are also self-aware enough that they will realize that when they use their allowance to by a large mocha from the coffee-shop along with a huge donut, they feel like c**p the next day… And that Big Mac or Teen-Burger also makes them feel ill…. after a few sessions of this, they suddenly develop an aversion to those foods that make them feel ill…. And teens are old enough to read the books, look at the websites, understand the reason why eating a SAD is bad news. 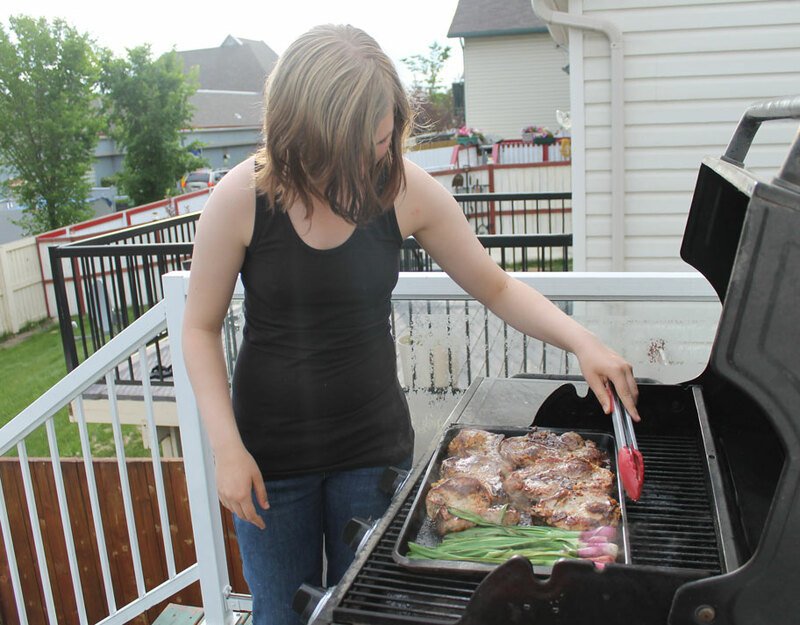 Teens are also old enough to take a turn with the cooking, and I know no better way of getting kids interested in food than to encourage them to cook a meal of their own devising. 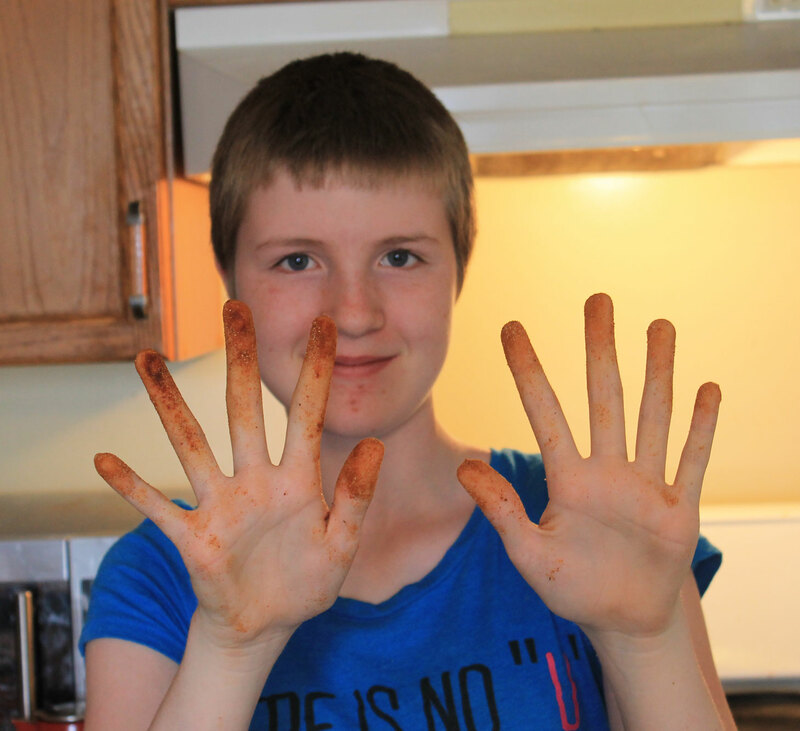 Proof that teens can cook…. Even if you have toddlers, you can get them to do really simple stuff like mixing up salad ingredients with their hands… and while they are doing it, encourage them to sample the individual veggies…. while it may not be perfect on the hygiene front, it is getting them to try stuff… besides it is your families bugs – you will be exposed to exactly the same bacteria when you kiss them good-night! Sadly I no longer have a kidlet of toddler age, so I can’t illustrate the last with a photo. Despite this, I don’t advocate an all or nothing approach… if you totally ban non-paleo foods they become forbidden fruit… the minute your child has access to them (at a birthday party, at a school event, snack-time at school/playgroup etc) they become all the more desirable. OK, don’t allow them in the house, but don’t outright ban them unless there is a food allergy or intolerance to that particular food ingredient. 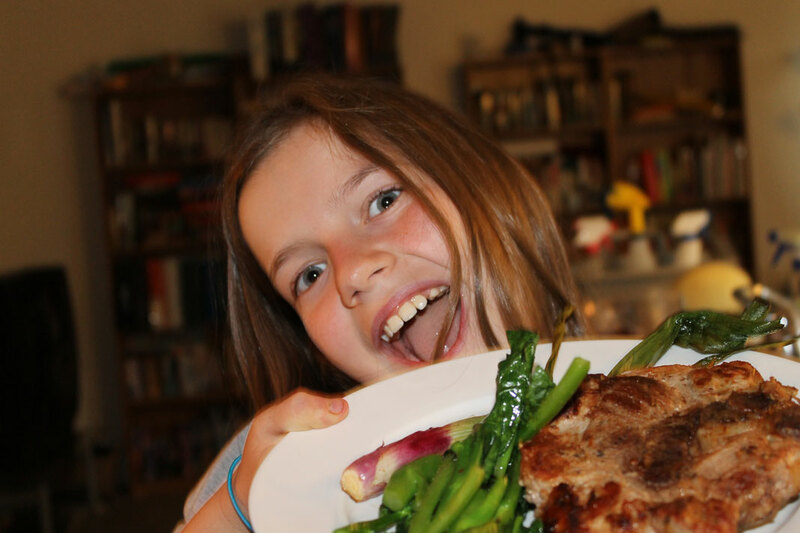 Let your child sample the non-paleo foods at social events (birthday parties etc), then talk to them about how they made them feel (even a toddler can understand that that food was not as tasty as mummy’s home-cooked food!). If they feel ill, they will gradually realize that eating them is not worth the suffering! One other solution is to make them paleo versions of the food that they are used to. You can “bread” chicken or fish with coconut or nuts to make a paleo version of chicken nuggets and fish sticks. Make cauliflower “rice” and zoodles or spaghetti squash in place of pasta. Make paleo treats on occasion to replace the pancakes, the cookies and the muffins. You can make paleo bread for pizzas or burger buns as well. By having a few easy go-to recipes that you can pull out when you need a paleo substitute for your kids favourites you can make that transition so much easier. And seriously, when your kids are young, it is YOU that controls the food that they eat. 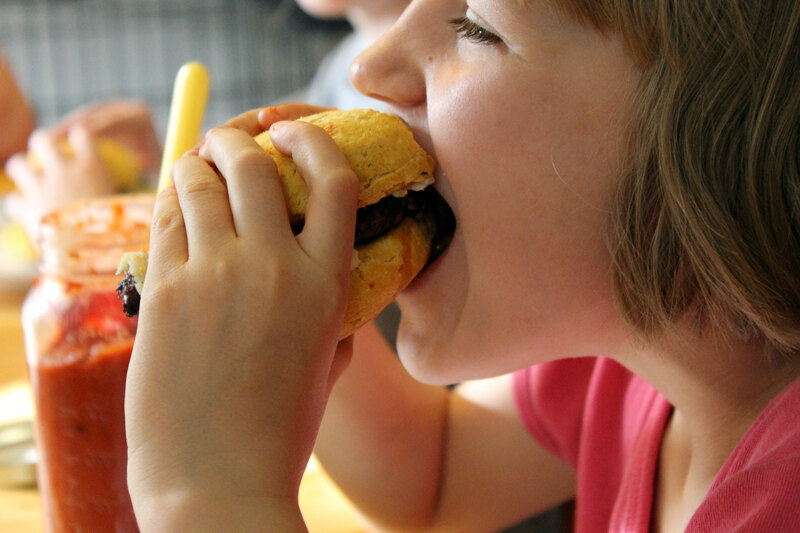 If your child is overweight or suffering from a food related illness, it is down to you. You are the one buying the food they eat. If you don’t buy it, they can’t eat it. Things do get a little more complicated once they reach the teenage years, true (Yes your teen will slink down to 7-11 occasionally to buy a Big-gulp, but hey, once in a while is not going to kill them! – C went to a friends house the other day and spent her allowance on a cheesecake! ), but if you educate your children on healthy eating habits (and a HUGE part of this education is them seeing their parents eating and enjoying healthy foods – family mealtimes RULE for this! ), then they will know how to make healthy eating choices for themselves in the future. Surely that is one of the best gifts you can give your children! I know there are a lot of other Paleo Food Lists out there, but why not make one up of my own? Spices and Herbs – can be freely used. This includes garlic and ginger. Most vegetables – remember, corn is a grain, not a vegetable even if it is eaten like one. Also avoid the starchy vegetables such as potatoes and sweet potatoes. Aim to buy seasonally, organic and local for preference. Green Beans – technically a legume but can be eaten raw, and low in the anti-nutrients that most legumes contain. Pea-pods (mange-tout/snap-peas) – technically a legume, but can be eaten raw and are low in the anti-nutrients that most legumes contain. Fruits – most fruits are high in sugar and should be eaten in moderation. These are the ones that are best to eat. Aim to buy seasonally, organic and local for preference. Meat – if possible buy only grass-fed/pastured/wild meats. Eat the fat and the skin where possible as well and consider nose to tail eating including the organ meats. If you are having to buy meat that is not grass-fed/pastured (most standard grocery store meat), choose the leanest cuts possible and trim the excess fat as it will be very high in inflammatory-causing omega 6 fats. Fish and Seafood – choose sustainable wild-caught fish and seafood where possible. Avoid farmed fish such as salmon as the flesh will be low in omega 3 and relatively high in omega 6. Consider eating the roe (eggs/caviar) from fish. Caviar (fish eggs/roe) – avoid sturgeon caviar as they are rapidly becoming an endangered species. Choose caviar from other fish instead and consider eating the roe/eggs you find in your fish when gutting it. Eggs – The eggs of all birds are Paleo. Where possible eat only pastured eggs or omega 3 enriched eggs. If necessary, eat organic eggs as a third choice. Avoid standard grocery store eggs as they will be laid by unhealthy hens that are raised in very overcrowded conditions. Cooking Oils/Fats – Avoid the grain based oils, most nut and seed oils and “vegetable oil”. Also avoid all trans-fats (including margarine). Where possible use only animal fats that are pastured/grass-fed/free-range. Consider saving the fat that renders out of the meat you are cooking. Vegetables – these are the more carb-heavy vegetables. Best avoided or eaten in moderation if you are wanting to loose weight. Aim to buy seasonally, organic and local for preference. Fruits – these fruits are higher in sugar, so limit your consumption, especially if you want to loose weight. Remember, drying fruits concentrates the sugar, and each dried fruit counts as one whole fruit. Eat your fruit as whole fruits not fruit juice as that way you get the benefit of the fiber. Aim to buy seasonally. Organic and local for preference. Nuts and Seeds – these should be considered more of a condiment. Nuts and seeds, with the exception of macadamia nuts are very high in Omega 6 and chestnuts are very starchy and high in carbs. Meats and Fats – these are ok to eat in moderation as long as you can source quality bacon/ham that has been cured without sugar. For preference choose meats that are nitrate free and made from pastured pork. Dairy – These foods are Primal rather than Paleo. For some people they can be problematic, others will have no issue with them. Where possible, buy only organic or pastured dairy. If raw unpasteurized dairy is available buy that as a first preference. (Not possible in Canada where it is illegal to sell raw dairy). Sweeteners – these natural sweeteners can still cause a spike in insulin levels, so keep the use to a minimum. Their saving grace is that they contain some trace nutrients. Stevia – sugar free, but can contribute to maintaining a “sweet-tooth”. Other Foods – some of these foods can cause a problem for some people, others don’t have a problem with them at all. Grains – low in nutrients, high in carbs and anti-nutrients, these are best avoided. Legumes – the only exceptions I make to these are green beans and pea-pods. While technically still legumes, these do not contain many of the anti-nutrients that the rest of the legumes contain. They can also be consumed raw. Sweeteners – these foods contain mostly empty calories and will cause a spike in your blood sugar, with a resulting rise in your insulin levels. Beer and spirits made from grains (Whisky, Rum, Vodka etc), sweet wines. And finally all highly processed food. If your great-grandma would not recognize it as food don’t eat it. Read the labels. If it contains any ingredients listed in the “Do not eat” category above, do not eat it. If there are more than 5 ingredients on the label don’t eat it (most processed foods contain far more than 5 ingredients). If it contains ingredients that you don’t recognize or cannot pronounce don’t eat it. The Paleo-Vegan – a contradiction in terms! Several times this week I have encountered people who are claiming to be both Paleo AND Vegan. The first was a 14 year old girl. She was celiac, so she would not be eating any wheat. But she was getting all her protein requirements from pulses…. HELLO? Pulses are NOT Paleo! What she is is a grain free vegan or a celiac vegan. What she is NOT is a Paleo-vegan. And there have been others like her. I am sorry, but it is impossible to be a Paleo-vegan. You just cannot do it. If you are vegan, you get your protein from soy, pulses and grains – all plant based sources because you do not eat any animal products. If you are paleo, you get your protein from animal based products – meat, fish and eggs and you avoid soy, pulses and grains. The 2 are simply not compatible. I think even being a paleo vegetarian would be very hard to do – while you can eat eggs, dairy is not Paleo. So you would have to get your entire daily protein allowance from eggs. And I think you would get sick of eggs mighty fast in this case. It might be slightly easier if you were primal and ate some dairy as well, but even then it would still be very hard going. A pescatarian might be able to do it though. They eat fish, so you could limit your food choices to fish and seafoods, eggs, veggies and the good fats… and a diet high in wild caught oily fish would be very healthy. But for me, I choose not to limit the animal protein I eat, but I do avoid grains, pulses, dairy and mass-produced food. I eat lots of veggies with moderate amounts of fish, meat and eggs, along with some healthy fats (avocado, coconut, olive oil etc). And that is what makes me Paleo. So why do they claim to be Paleo when they are so blatantly not? But they are failing to understand what Paleo is…. So… you have gone Paleo, and all that grass-fed beef, pastured pork and free range chicken is adding up. The organic fruit and veg is costing more and your spouse is bugging you about the increase in grocery costs. Maybe he/she is telling you that you cannot afford to eat this way and that you have to go back to your old (SAD – Standard American Diet) way of eating. Did you know that there are ways to reduce your food costs dramatically while not compromising on food quality? These are my top tips for doing Paleo/Primal on a budget. Buy in bulk – we buy half a pig for $250 from the farmers market. We can buy half a grassfed cow for just over $1000 (sounds a lot, but do you know how much meat you get from half a pig or half a cow?). it costs way less that way! We get it conveniently packaged in meal-sized portions, already frozen and ready to pop in the freezer. We buy one half pig every 3-4 months and half a cow about once a year. Yes you do need to invest in a chest freezer and it costs a lot at the time, but the savings are worth it. From our last half pig ($250 worth, we got 3 hams worth over $150 at their full retail price! and this was premium pasture-raised pork cured in a sugar-free cure!) We also got half a dozen packs of bacon (same sugar free cure), several roasting joints, lots and lots of packs of pork chops, and a whole bunch of sausage. The previous time we didn’t get the hams and went with pork cutlets instead…. Keep an eye out for Groupon or Living Social deals for real meat from quality butchers and use them. They can significantly reduce your meat costs. Buy wild salmon during the salmon run and fillet it yourself. Divide into portions and freeze for later in the year. There are tutorials on you-tube that will teach you how to fillet salmon. In fact, consider learning how to fish and catch that damn salmon yourself you get it for little more than any licencing fees and the cost of the equipment that way! Buy other fish and seafood when on speciall offer and stash it in the freezer. Consider learning how to hunt and score your own wild meats that you can freeze for later use…. licensing requirements vary depending on where you live. Check it out online via Google. If you live near the coast, buy fresh fish and seafoods direct from the boat – or ask about going on fishing trips where you can catch it yourself. If you live inland, consider a vacation to the coast and go on the same trips… freeze the catch and transport it home in a cooler…. This does assume you have access to a freezer in whatever rental/holiday home you are staying in and that the trip home won’t be so long that your fish/seafood will thaw before you get home. Don’t risk food poisoning please! Make friends with the vendors at your local farmers market. Talk to them, ask about their day and how their sales are going. And talk to people who are wondering whether to buy the product. Extol it’s virtues and when the vendor makes a sale you are likely to get a discount… We regularly score discounts for Wapiti Ways Elk and Buzz Honey by this means. Save all the bones, chicken carcasses. fish bones and shrimp heads and shells and make your own bone broth (I have been known to buy frozen “dog bones” from a grass-fed beef butcher and turn them into broth! there is no difference between a dog-bone and a stock/broth bone apart from the price!). Add your vegetable trimmings to the broth as well. There is no need to waste onion tops, broccoli stalks and the tops you trim carrots or any other vegetable trimmings. Add herbs and other veg from your garden too. They will all provide nutrition. Waste nothing – if you can turn it into a soup or broth do so…. soups are very frugal lunches (one of my daughters likes soup for breakfast!) I regularly make “clean out the fridge soup” for lunch – that means I take all the veg that needs using up and dump it into a pot with some bone broth and cook till tender. Season add herbs and often a can of coconut milk and blend till smooth… no matter what goes into it, it always tastes delicious. You can use broccoli stalks, kale stalks, carrot tops and the trimmings from celery, onions and most other veg this way. Eat the best quality veg you can – join a CSA if it is available in your area. and eat local and seasonal veg. That way you are not paying a premium. Seasonal veg is always cheaper and by joining a CSA (Community Supported Agriculture) you are supporting the farmers who are growing your food. Don’t forget to visit their farm if they have a Customer Appreciation day and meet them in person… get to know them, they are your friends! Shop on the outer edges of the store – the stuff in the middle (the mass=produced conveninece foods) is more expensive nutrient for nutrient. Monitor freecycle for fruit and veg give-aways. Every spring I see people offering rhubarb. every summer it is zucchini, evey autumn people are begging you to pick the excess apples off their trees. Those can all be canned or frozen to eat later in the year. Try ethnic grocery stores – we buy really good, cold-pressed extra virgin olive oil for a fraction of the price in the grocery store (and much better quality!) at a middle-eastern grocery store. They also are the only place I have found in Calgary that i can get Dandelion greens at a good price and escarole for less than a dollar a head…. I also buy quality feta cheese for my feta monster (A) from this store and the most fantastic kalamata olives. Don’t be afraid to shop at several stores – we monitor the flyers and websites of our favourites – we currently shop at 2 different farmers markets, the middle Eastern grocery store, and Asian grocery store, Costco and a standard grocery store to get the best deals…. all in the same day! It takes a bit more time but the savings are worth it. Take a cooler to keep temperature sensitive stuff cool, lots of bags, relax and enjoy the process… Consider it a day out! Costco can be a real source of bargains for the discerning shopper. Avoid the ready produced stuff that is full of additives and the bakery section. Head for the produce, and fish.. And then consider some of these gems I have bought from Costco: Balsamic vinegar, sundried tomatoes, crab meat, hemp hearts, flax seeds, chia seeds, walnuts, almonds, dried figs (and fresh fings, plus goat cheese to stuff in them! ), prunes, dried apricots, almond butter, parmesan cheese and much more. Read the labels and remember that any meats are likely to be raised in a CAFO, so they are not as good as the pasture raised or grass-fed…. 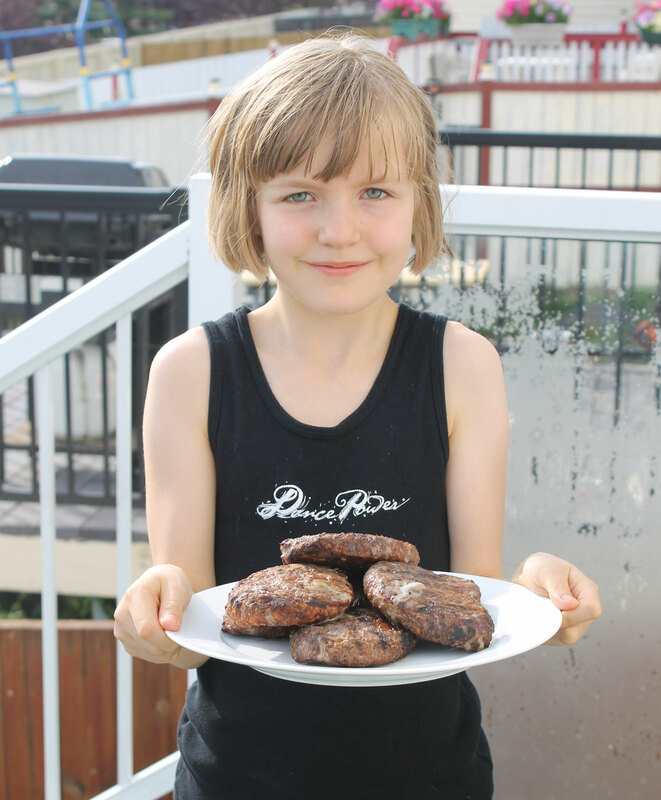 plus in the US they are going to be full of antibiotics and growth hormones… But you can get some really good stuff at Costco if you are careful – we scored some Heritage beef Albertan grass-fed burgers the other week! Also any veg you buy is not local bear that in mind. And my biggest tip for saving money while eating Paleo is to cook everything for yourself….. the more mass produced the product, the bigger the expense. If you cook for yourself you make savings! See eating Paleo doesn’t have to be expensive afterall!